The schoolgirls, dressed identically in plaid outfits, hung their heads in exhaustion gently rocking from side to side in unison with the movement of the train. As the train slowed at our stop, their bob haircuts swayed across their noses and back again. I didn’t know it yet, but their tiredness foreshadowed the week to come in Fukushima—the place I would be spending the next ten days. No doubt you will remember hearing about Fukushima in the recent past. Not many of us will ever forget seeing images of that tidal wave sweeping over the sea wall and engulfing everything in its path. This disaster was unfortunately followed by the news that the tsunami had also caused the explosion of Fukushima 1 at Fukushima Nuclear Power Plant on the following day, March 12, 2011. 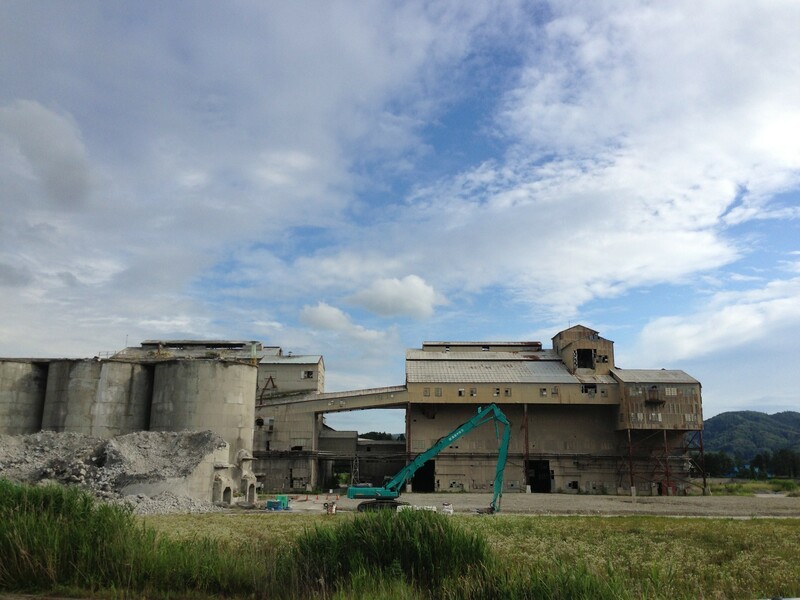 Now I was in this Fukushima, hardly two years past the disaster, and finding myself in a position to explore this region and, if at all possible, offer ideas and inspiration to an area newly abandoned by its citizens. But on this day, the day of my arrival, I was more captivated by just observing the people and the landscape as it flew by the train windows. It would not be the first time I would notice this almost charming and close-knit habit of train-napping. In fact, watching people sleep on the train is a comically common occurrence in Japan. Businessmen often offer their shoulders to neighbors who have fallen asleep accidentally. The buzzer that dings at each stop is jarringly loud, perhaps intentionally so that you will wake every few minutes and make sure not to miss your stop. The system is designed to accommodate the very, very tired. I was on the train with the sleeping schoolgirls and eight people I had met just hours before at the main terminal of Tokyo Station. We had traveled from subway to bus to commuter train, and had come from Tokyo, the largest city in the world, to one of the most rural and under populated areas in Japan, all in the course of four hours. From passing along the highway and seeing skyscrapers for miles, we were now moving at commuter speed past unending fields of rice and tobacco. Rice fields, Fukushima. Photo A Koger. The nine of us were a diverse group. There were four Japanese students from Meiji University, 4 students from Thailand, and me, the one American attending the workshop from the University of Oregon School of Architecture and Allied Arts Department of Architecture with professor Hajo Neis of the Portland Architecture Program. When we disembarked the train, we were greeted by the rest of the students attending the workshop, a group of eight Indian students, a landscape student from Iran, and two more Japanese students from Tokyo University. We communicated in English and asked questions of each other’s backgrounds. I quickly learned that the Indian student were from C.E.P.T. University in Ahmedabad, India, where I had attended a study broad during my junior year of undergraduate. When we learned we had friends in common, we quickly became friendly and verbalized the all too common phrase, ‘what a small world!’ But it was true; it was so interesting that we were all instantly comfortable with each other, even though we didn’t really know what came next on our adventure. It was a sunny, warm day, and we sat outside and joked and waited to see what came next. 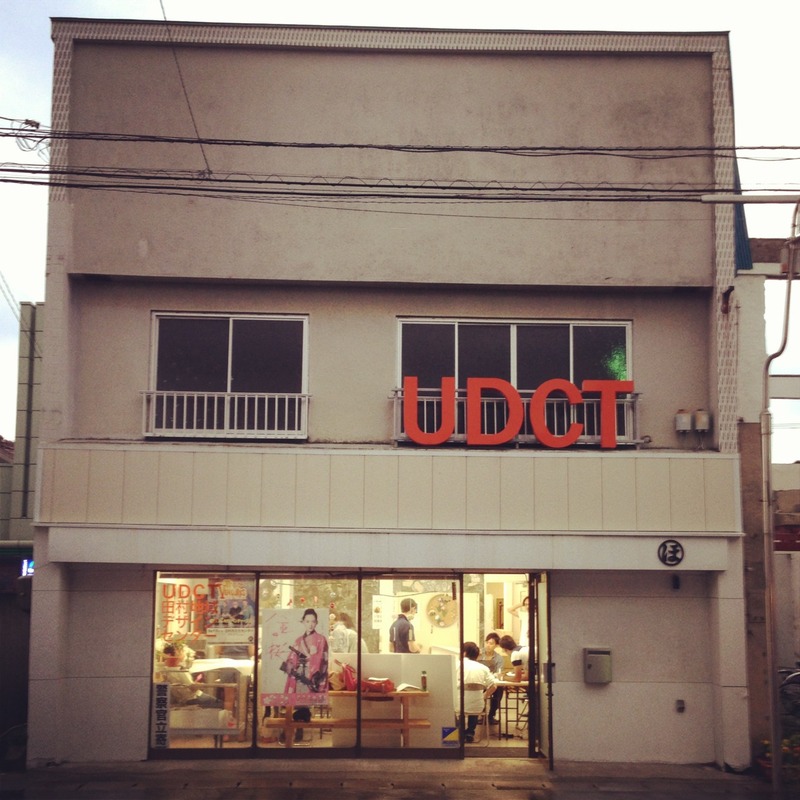 We walked through the street of the small town and came to our office for the week; with it’s acronym clearly spelled out in neon orange letters on the building: UDCT- Urban Design Center Tamura, the only open building on the street. The purpose of all of us in Tamura for 10 days was to help with this exact problem. 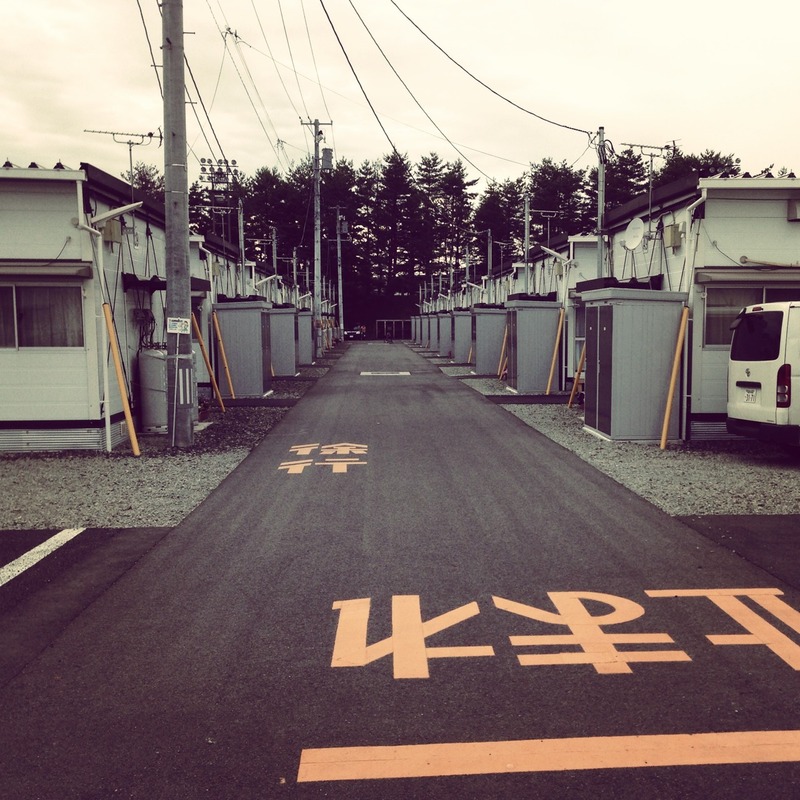 Tamura city, a collection of 5 small towns within rural Fukushima, is a shrinking city. Since the earthquake and subsequent nuclear power plant explosion, this problem has been exacerbated. Many people who were forced to leave during the earthquake have decided to not come back, and Tamura is struggling to survive. In addition to our group of students, we had onboard with us University of Oregon Professor, Hajo Neis, Meiji International University professor Masami Kobayashi, employees of the Architectural Institute of Japan (AIJ), and employees of the UDCT. 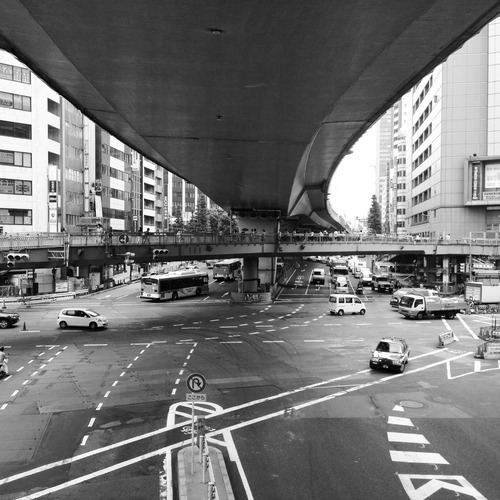 Our goal was to learn about Tamura, and use our architecture and urban design skills to come up with ideas for ways to improve Tamura and encourage people to move there and to visit. 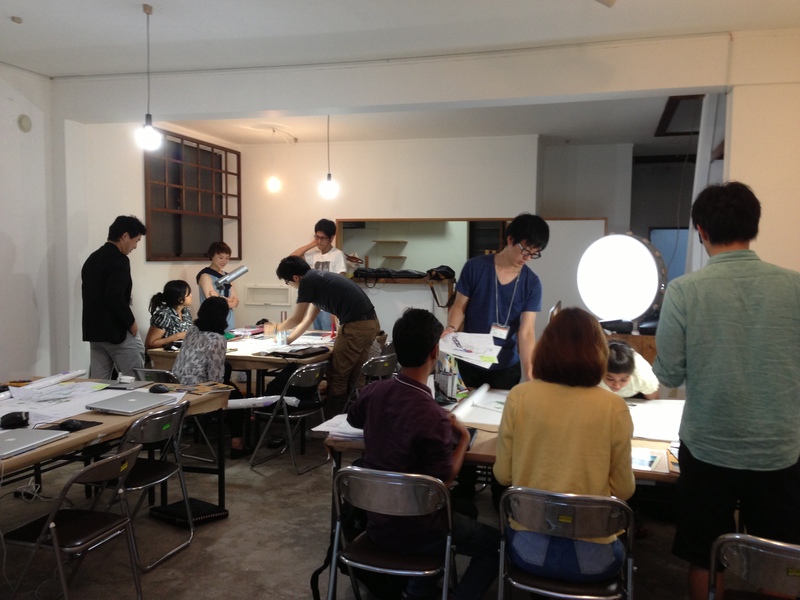 After learning the basics about Tamura, our research started the second day. In a single day, we traveled to all the small towns in Tamura and met with interested townspeople to learn about the history of the place and the visions for the future. We were all enthusiastic with what we knew to be “good” ideas: we knew a lot needed to be done, but to each of us, it seemed like a place of opportunity., We were driving through miles of beautiful farm land, and it was easy to forget that there was anything wrong. 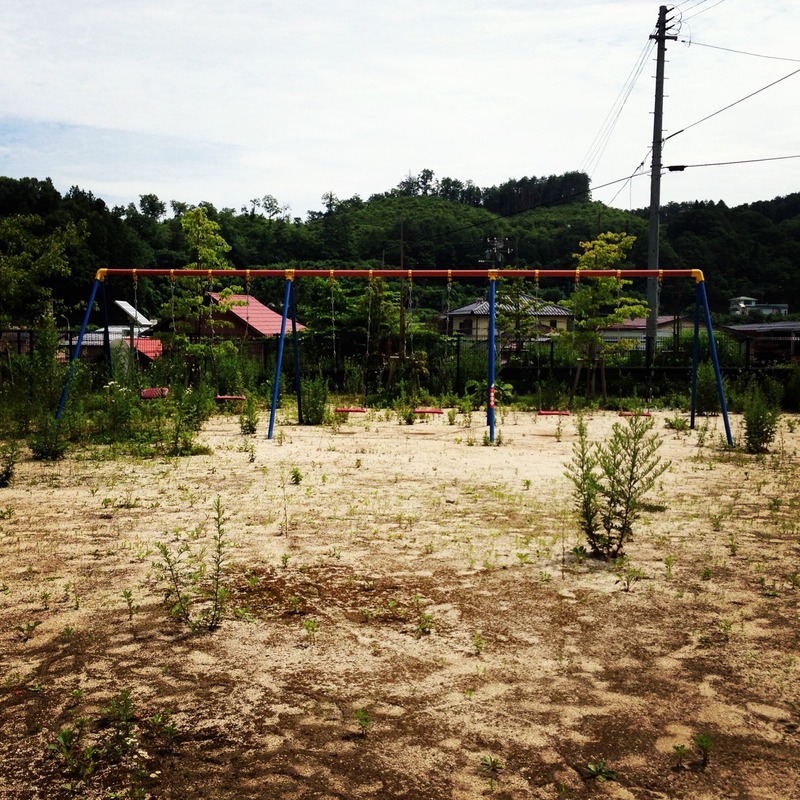 Then we would see the piles of bags of contaminated soil and be reminded of why Tamura needed our help. On the bus between towns, I industriously sketched ideas and wrote notes of my urban design thoughts. The next morning, we each needed to have a design proposal, and I was squirming with ideas. 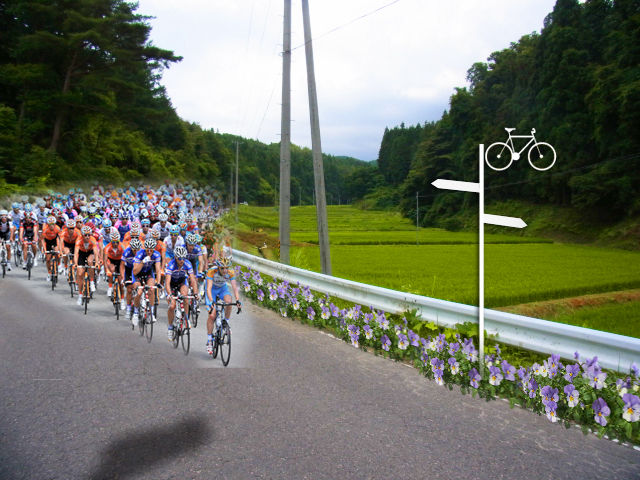 I came up with an idea of connecting the small villages of Tamura with a cycling road. Being a road cyclist myself, a hobby inspired by several years in amongst the avid and somewhat crazed cycling ethos of Portland, Oregon , I quickly fell in love with the winding roads of Tamura and thought it a great place for cycle-tourism. The roads are of high quality and they meander through the beautiful rice field scenery, something I had never seen before traveling to Japan. 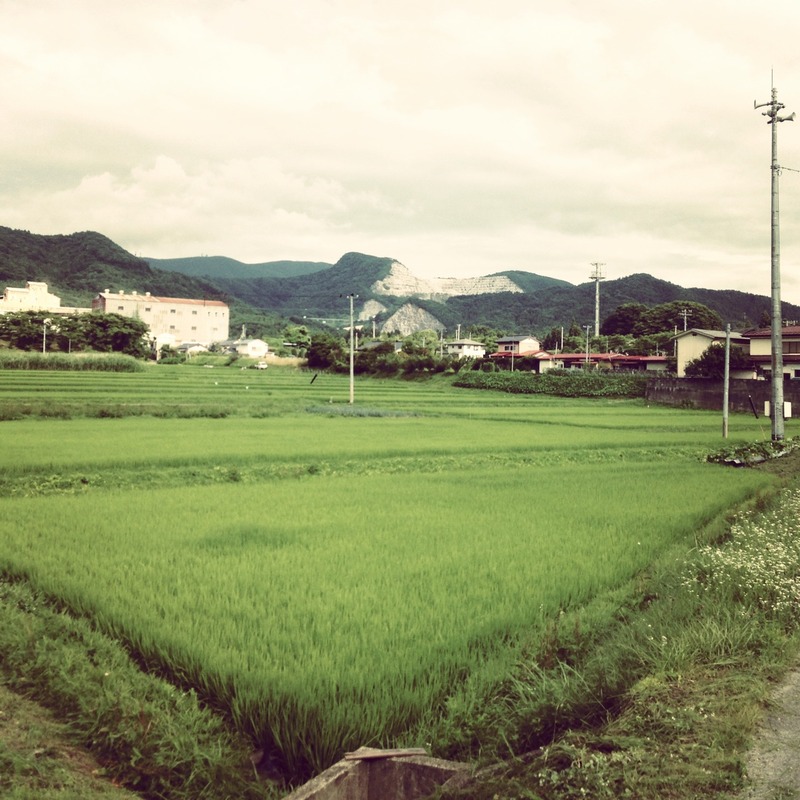 I was embarrassed when I had to ask, ‘so… where are the grains of rice?’ I quickly learned from Hiroshi, one of our professors from the AIJ, those don’t grow until September and October, just before harvest. Without a single word exchanged, a yen coin was given to me by our driver, a local farmer, to explain. He flipped it over and pointed to the mature rice plant insignia on the back. My cycle-tourism ideas coincided with some other ideas of students in the workshop, so five of us were grouped together with a theme to explore: ‘Tourism and Existing Local Assets.’ The process moved very quickly, as we didn’t have much time and needed to produce a presentation for the city Mayor and townspeople in two days time. We worked through schematic ideas and tried to come up with a theme for the urban design concept of bringing tourism to Tamura. We mapped all of the existing assets, we surveyed roads; we interviewed Inn owners and shop keepers; we looked at farmland and the vacant buildings on the main streets. When the day arrived for the mid-week critique, we were given good feedback from the professors and the townspeople, but we had a lot of work to do in the 4 days remaining in the workshop. Amazingly enough, by this time we were already in a routine. We left the hotel by 9 each morning, worked straight until 1, took a quick lunch break, worked until dinner, had a review with our professors, and continued working until exhaustion set in around 10, when we would return to our hotel to relax in the Onsen hot tub for 30 minutes and, then, fall instantly asleep in the tatami room. It was grueling and truly immersive, and I was exhausted; but I was having such a good time I barely noticed how tired I was. 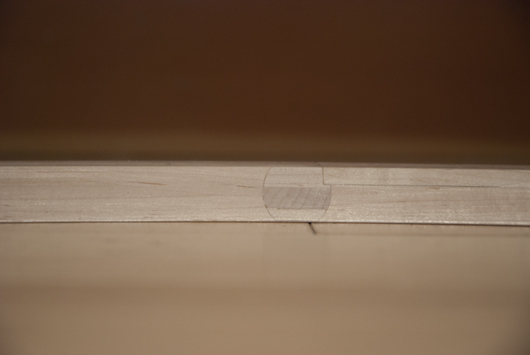 The last few days of the workshop felt intensely like the last week of a studio project. We had too much to do and not enough time. 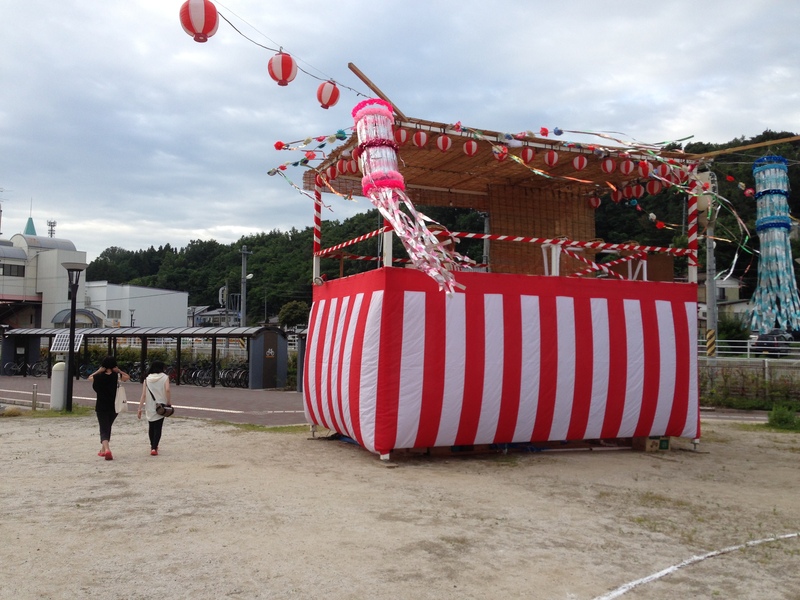 It was rewarding though, because we knew that the more we could show the people of Tamura, the more excited they would be about their city and the more energy could be restored in the community. Our idea had become a little complex, but also refined. We were proposing a system of cycling paths through the region that would reconnect the small towns. 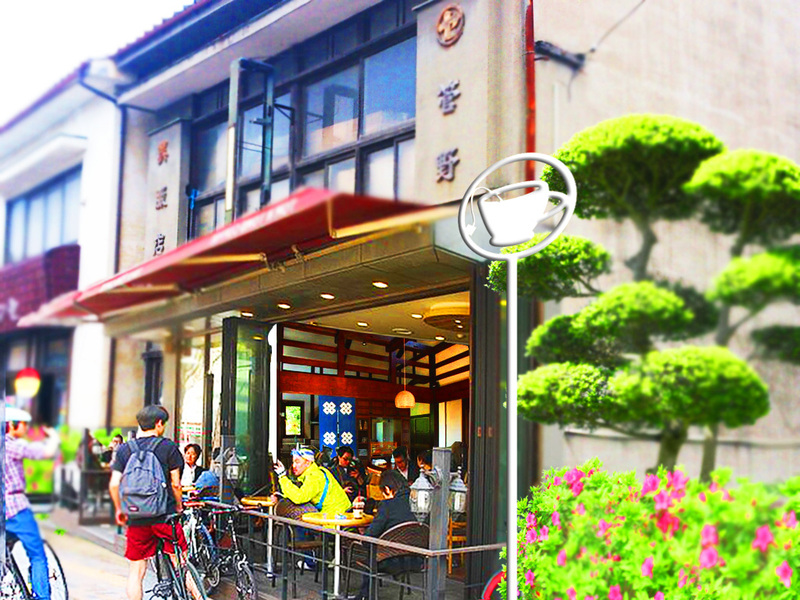 At each town, a group of resources would be provided, including a café, cycle repair shop, rest rooms, and convenience store. These resources would be created in the existing vacant buildings, helping to revive the town main streets. 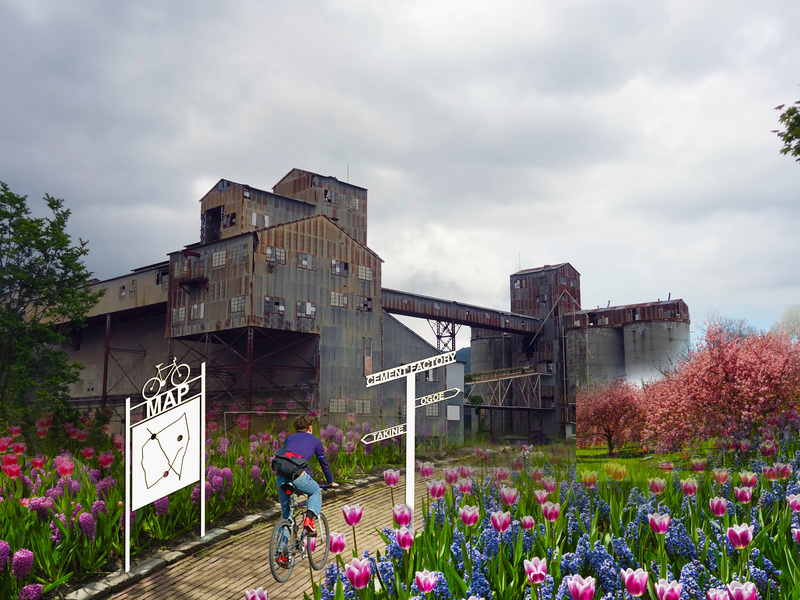 A new street signage campaign would modernize the navigation, and flowers would be grown throughout the region to help diversify the scenery along the route. The Mayor loved our proposal; saying that he would like to implement our signage strategy in Tamura soon. It was really nice to see how all the towns people appreciated our design efforts and it helped them to see hope for the future of the city. The workshop was an extremely satisfying experience. Every night, no matter how tired, I managed to write a few pages in my diary about the events of the day. I somehow found the energy, and it helped me to unwind after the intensity. I will admit, more than once I fell asleep with pen and diary in hand. The memoirs included in this article are excerpts from my diary. I have always been interested in visiting Japan. I think my design sensibilities are somehow Japanese: I love concrete architecture, simple spaces, and eating while sitting on the floor. Tadao Ando is my ‘favorite architect,’ if I have to do something as silly as choose only one. My favorite coffee mug that I drink out of every morning has J-A-P-A-N etched into the ceramic base. I drink green tea: the bitter Matcha kind that most people don’t like. I try to live simply. I eat my spaghetti with chopsticks. and I eat sushi with my family for Christmas dinner. 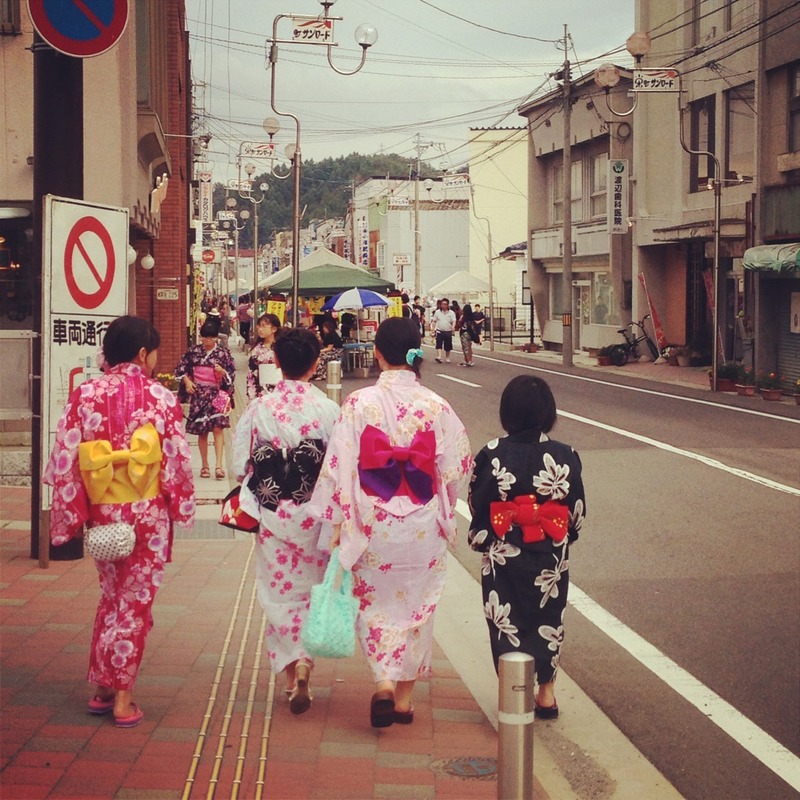 I know none of these Asian customs makes me closer to Japan… but I guess I am just saying that I have appreciated, and admired, Japan for a while without really knowing why or where the infatuation began. Now that I have visited Japan I know that my infatuation has transformed into a respect and a knowing that Japan is a place I feel incredibly comfortable. The most amazing thing to me is that sense of comfort never waivered during my trip, even with the huge contrast in my experiences. I felt just as safe, and welcomed on the busy streets of Tokyo as I did at the workshop while staying in the radiation contaminated Fukushima. The people everywhere are respectful, kind, and thankful for what they have. 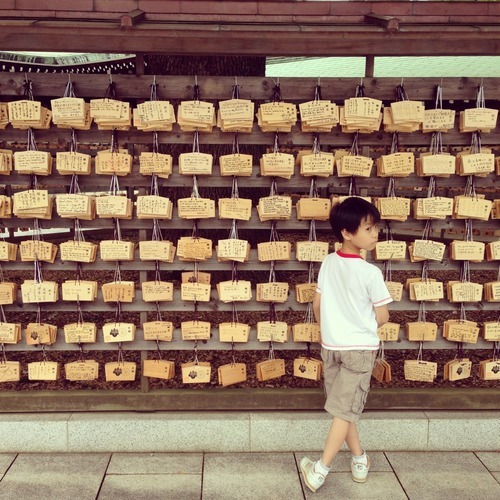 I actually never felt sad during my trip in Japan. 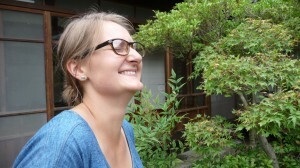 Even in Fukushima I was filled with an overwhelming sense of hope. I have no doubt that the people in Fukushima will overcome the disaster and excel way beyond its boundaries. I respect so much that the Japanese never sit around and feel sorry for themselves. They are constantly propelled with forward momentum, and for that reason I believe they can never fail. The sense of hope is incredible. The Japanese are the kindest people I have ever met. I hope to always be inspired by this determination and kindness. 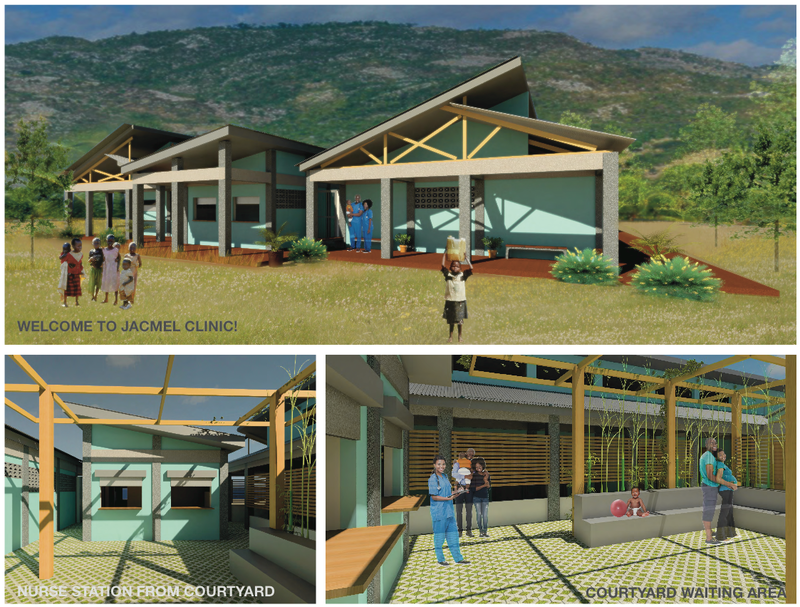 Students collaborate with professionals on an interdisciplinary, student-led project to create a new healthcare clinic in Jacmel, Haiti. 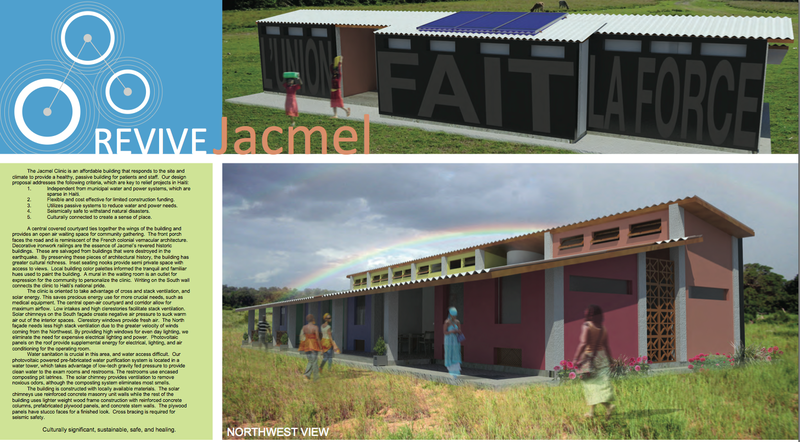 This summer 2013 REvive Jacmel, an inderdisciplinary student-led project to create a new healthcare clinic in Jacmel, Haiti, held a competition and subsequent awards reception at the University of Oregon in Portland School of Architecture and Allied Arts. 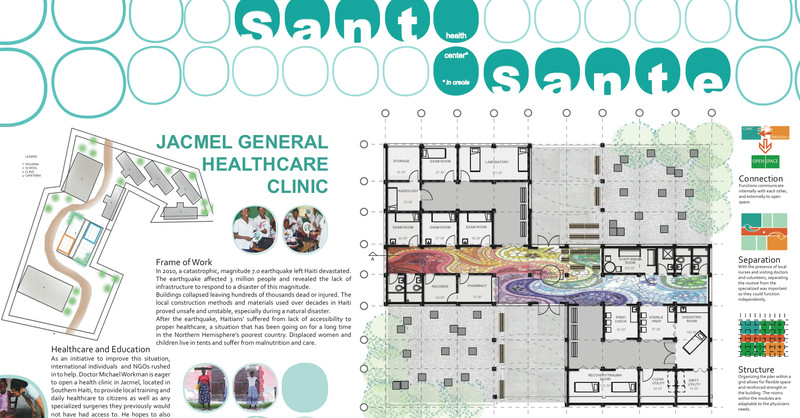 With guidance from Waterleaf Architecture, UO in Portland Department of Architecture students Annie Ledbury and Beth Lavelle organized and coordinated the REvive Jacmel charrette and competition to develop a design for a small general healthcare clinic to be built in the Haitian city of Jacmel, a town continuing to recover from the 2010 earthquake. With direction from Nancy Cheng, UO in Portland Architecture Program director and associate professor, Ledbury and Lavelle, along with UO student Rachel Peterson as research assistant, worked with the project’s instigator, Dr. Michael Workman, a Portland-Vancouver based plastic surgeon. Workman, Ledbury and Lavelle organized students from UO, the University of Portland and Oregon State University to work collaboratively on the design. Workman is part of RestoreHaiti, a group dedicated to improving healthcare conditions in Haiti. The REvive Jacmel project began as an addition to Workman’s efforts to organize “monthly health care teams [to] bring much needed medicine and staffing to local medical clinics” to improve health care in the region. On his many volunteer trips to Haiti to administer healthcare, Workman saw the lack of modern medical facilities. He recognized a need for a clinic that could perform dental procedures and major surgeries using general anesthesia . 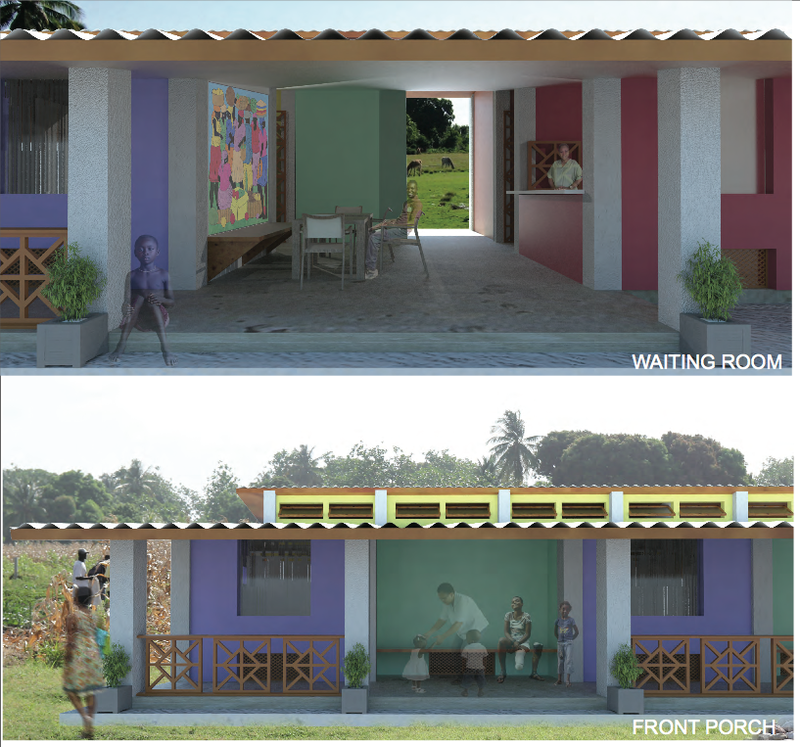 The clinic would have to be approximately 2,500 square feet, fully functional off-grid with only generators for electricity, and otherwise operable with little access to utilities and modern conveniences. It would need to be built by local residents with their knowledge of and ability to construct using local materials and minimal direction. University students in the REvive competition worked with architects at Waterleaf Architecture and engineers at KPFF Consulting Engineers, who are also involved in the project, to further develop their concepts with expert guidance. At the September 5 competition awards reception held at the University of Oregon in Portland School of Architecture and Allied Arts, the student teams presented their entries in the REvive competition. After the jury members deliberated and the assembled crowd had a chance to vote for People’s Choice, the team awarded Best Overall, Most Constructable Scheme and People’s Choice, was Grace Aaraj, Jackie Davis, and Matt Deraspe—all University of Oregon students. The project from the team of Grace Aaraj, Jackie Davis and Matt Deraspe received awards for Best Overall, Most Constructable Scheme, and People's Choice! 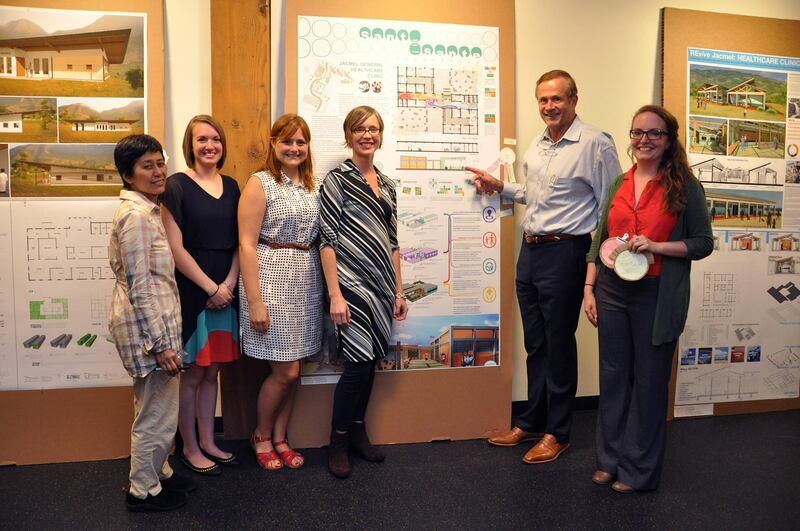 Pictured here are (l-r), Nancy Cheng (UO director of Portland Architecture program), student organizers Beth Lavelle and Annie Ledbury, Waterleaf Architecture's Emily Refi, Dr. Michael Workman and project team member, Jackie Davis. I am thrilled to be working on the Haiti project with such a great team. Having both enthusiastic students and professional advisers in all the fields working together on the project is making for a very exciting learning experience. From the designs submitted by each team, the best ideas will be further examined and selected by competition jurors and will be translated into construction documents in fall 2013 by students who will work closely with Waterleaf Architecture and KPFF. Construction is tentatively scheduled to begin in December 2013. Students Grace Aaraj, Jackie Davis and Annie Ledbury are confirmed to be contining with the project as it continues under the direction of Waterleaf Architects this fall and winter (2013-2014). Having our design chosen to get built was fulfilling in and of itself, but to now getting to see it through to the finish is an opportunity unlike any other in graduate school. It’ll be a steep learning curve with the tight schedule but I’m so happy to see things making progress for this great cause. For the winning design, it is like a dream coming true: to be able to design a building, win a competition and then join a firm with a lot of professionals to help you develop it further and make it come to life. On a similar note, it means a lot to me to be part of this project since it targets directly a daily life and real situation problem. In my conviction, architecture like any other art or science (in fact, architecture is a symbiosis of both) should serve people. It was a fresh experience to stay away from any autobiographical move in the project, go back to basics and use the same language ( materials, needs, colors, traditions) of the locals in Jacmel. 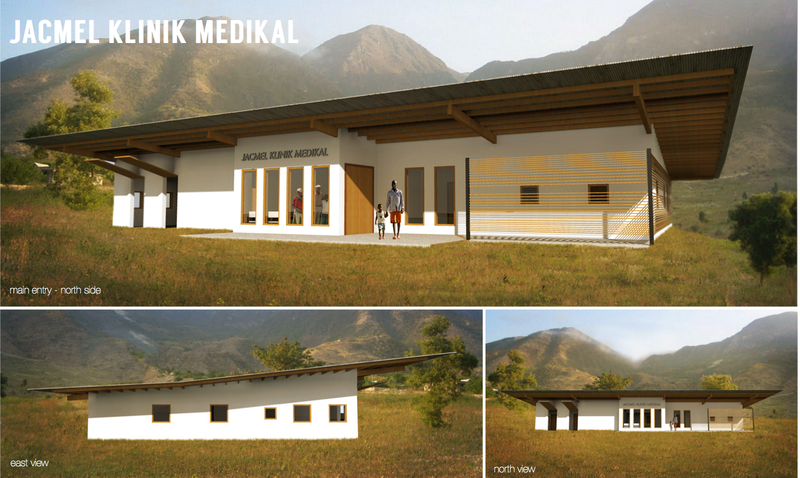 I hope the project will be really built, and I will be able to see it one day, and maybe volunteer in Jacmel as well. The partners in the REvive Jacmel project include Workman, UO in Portland Department of Architecture, University of Portland Shiley School of Engineering, Oregon State University School of Civil and Construction Engineering Construction Engineering Management, Waterleaf Architecture, KPFF Consulting Engineers and the Associated General Contractors of America (AGC) Oregon Columbia Chapter. I think the most important thing I learnt is how to design this real project, for real people in time of crisis. In architecture school we are usually limited to site constraints or specific clients’ needs provided to us through discussions with professors and students. What would make us feel safe and cared for? What is life like before the earthquake? How is life after it? It was more like a recipe where we must fulfill functional requirements, and be “limited” to the local materials and craftsmanship. Towards the end we learned that we were not “limited” by these factors, rather INSPIRED: this is when Jackie, my teammate and I, were able to liberate our design and include interactive community spaces, shaded outdoors and backyard (etc…) using only local resources. We used the site disadvantage to create a prototype that could be adapted to sites with different slopes or orientation, not only for Jacmel, but possibly for other places. We were very limited in time , Jackie and I, since I was in Tokyo for 2 weeks and then i came to Beirut and Dubai. So we managed to invest our time to the best use. We were very communicative and we tried forgetting about deadlines or stress. We would take walks, talk to people and watch documentaries. All the decisions were taken before I came to Beirut. For the last week, we would work online and share files on Dropbox. It was very interesting to work with a 10 hours difference. It was also very rewarding to sleep, wake up and find the other person’s work on the shared folder. The synchronization was a big incentive for us to work. Open from July 13 to August 24, 2013 at the University of Oregon in Portland School of Architecture and Allied Arts White Box Visual Laboratory, Ruf•fle presents plenty of opportunity for White Box visitors to engage in an examination of perception, identity, and the meaning of objects, complete with psychological and cultural aspects. The exhibition features work from a group of Portland-based women traversing opportunities uniquely afforded to interdisciplinary art and design dialogue. The work in Ruf•fle explores individual inquiry within an overarching collective and shared conversation. It is at once thought-provoking, unfamiliar and recognizable. The inclusion of work in this exhibition by individuals Sara Huston and Jennifer Wall brings to the forefront the dynamic proximity of conversation and the representation of what it can mean to “ruffle.” Huston and Wall, both UO adjunct instructors in the Portland Product Design Program presented pieces that authentically represent the “diversity and value of collaborative analysis through cross-disciplinary insight” in exhibited pieces, Tiny Parametric Ruffles by Wall and Permanently Liminal by Huston. 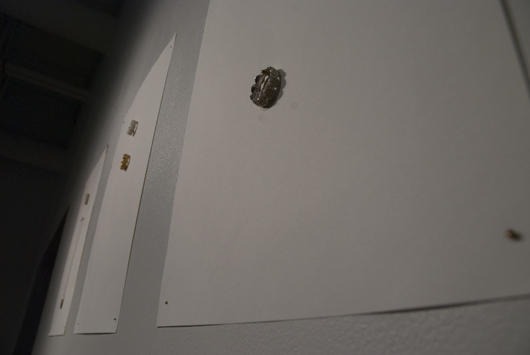 Wall’s pieces, painstakenly and metaphorically hung as if 2-dimensional with miniscule brass pins driven into predrilled holes in the four corners of fine book paper, present objects that “chase down the ruffled relationship between parametric modeling software and adornment.” (Wall, White Box Ruf•fle catalogue). Indeed, Wall proclaims herself to be “both metalsmith and designer, both maker and designer” which is a dichotomy that informs her work translating with material eloquence into her designs. One might say, Wall’s work blends the rich and diverse worlds of modernity and antiquity simultaneously transitioning and questioning methods and process both ancient and contemporary. 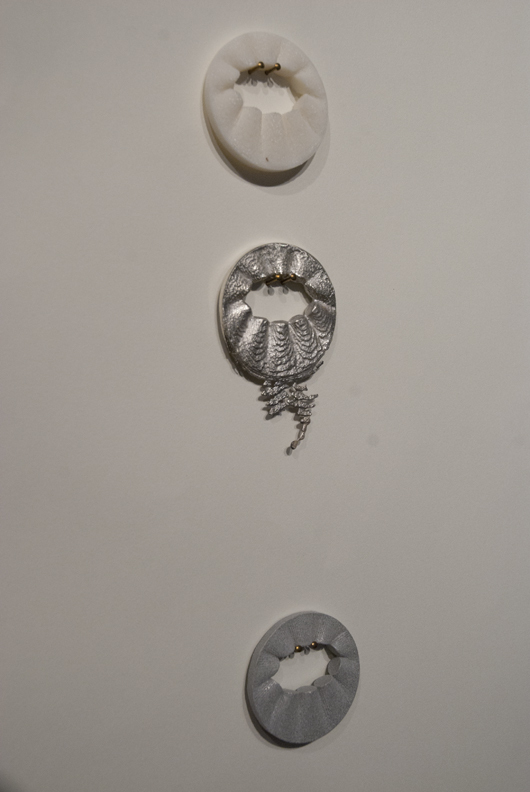 Her works soar from the mere designation of “jewelry” although on first glance what one sees is exactly that: objects in shapes traditionally and culturally recognized as rings, necklaces, small keepsakes, perhaps. But that is the peripheral, shallow view—look closer and see the materials ranging from the brilliant metallic allure of gold and silver, to white ABS plastic, to bronze, to aluminide and the natural, soft, shale-like layers of cuttlefish bone: all materials utilized to explore and push the idea of functionality of the design. 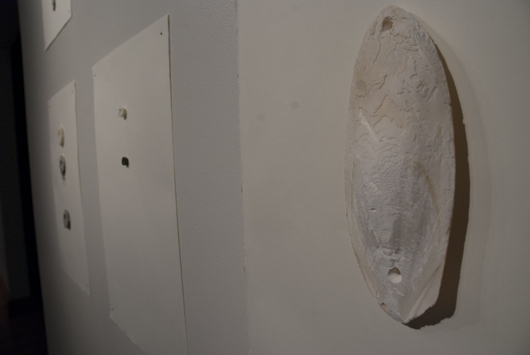 This play between the textures and the surfaces of the work, encouraged Wall to explore scale and the relationship between culturally-anticipated sized pieces, and pieces diminished or expanded beyond traditionally accepted norms. She also found a means to traverse the concept of adornment and how it functions as a symbol being both mediator and communication device between the wearer and the viewer. 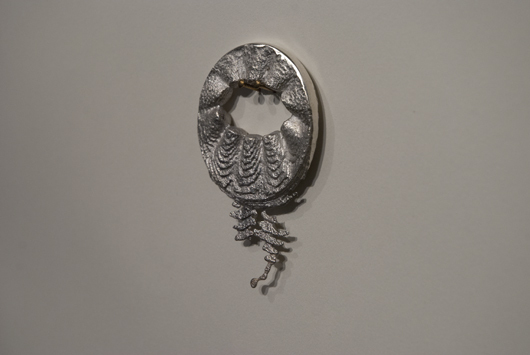 Jennifer Wall’s work represents an elegant dance between two worlds, one of cutting-edge technology and one of ancient techniques. Her blending of these elements enhanced by a quintessential relationship to the materiality of each piece, places her work into a dialectic process of method and understanding. Discernable within her work are the mindful topics of change and interaction between form, shape, size, substance, and cultural meaning. It is through a process of abstraction that meaning is attributed to her work, or the process by which we think about how her work changes and interacts with us and our expectations. 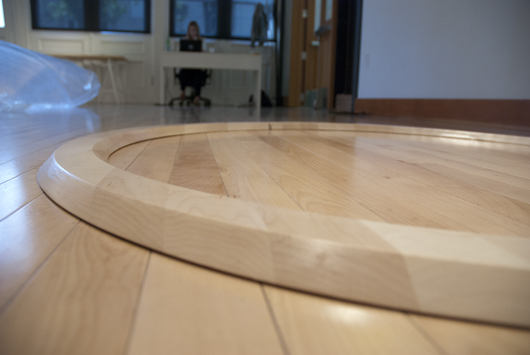 Having been involved in furniture (from the very literal and naïve definition) “making” projects, Huston’s work, Permanently Liminal was sparked by a sense of frustration from being called a “furniture maker” and the thought that she desired to reach far beyond the limitations of standard creative labeling or as she puts it, “I needed to exorcise or remove the theme of ‘furniture designer’ so as not to be pegged as one or the other.” Indeed, from her work (some viewable on her website), pieces such as Expectation 01 come across as what most would define as “furniture.” But the failure of her audience to look above and beyond the design aspect and not recognize the artistic component, was driving Huston to want to “rediscover how art and design and the space in between are like a religion and a mantra to [her].” Huston says, with a shy smile, “I am a provocateur.” A sense of wanting to question who she is and what she does, prompted her to create Permanently Liminal, a work that makes strong use of audio to get Huston’s point across. Permanently Liminal demands a closer inspection. 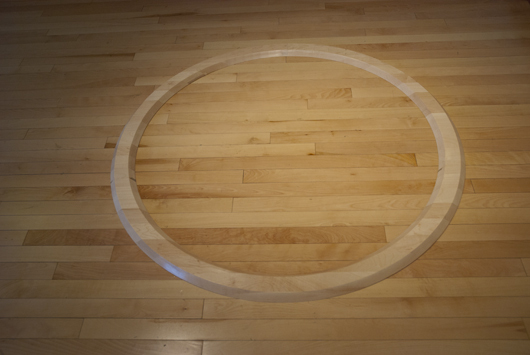 The circular threshold, at once familiar and yet oddly inappropriate, confronts the viewer with conflicting invitations: can one step over this threshold? And, to do so, where are you except in a confined and very limited space? Have you traversed some boundary or simply caged yourself within the halo of Huston’s finely sculpted sphere? This element of the circular liminality echoes back to a state of being on the precipice, existing in-between two or more acknowledged, perhaps, unclear, difficult, complex, and real situations. The threshold creates an environment for the individual to experience uncertainty, to be ruffled, to question what happens next, to be temporarily uncomfortable. In one sense, Huston compels us to think about reality and what we need to do to break it down into comprehendable parts. 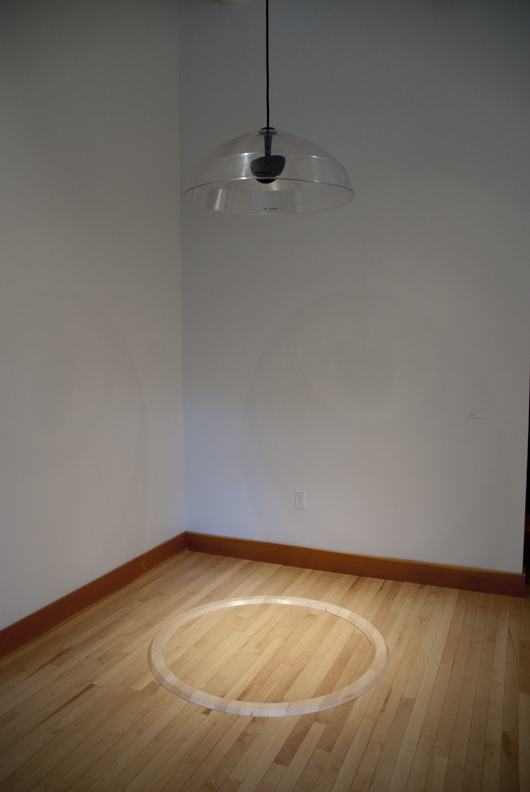 She puts us in a static ring, unnervingly similar in color and material to the White Box floor, and subjects us to an audio and physical redundancy of her voice telling us what she is and is not; the circumference facing us with the same position from all positions. Huston boldly questions her surroundings by separating out specific features and focusing on and categorizing them in ways she wants her audience to pay attention to. Both Huston and Wall expressed the sentiment that from experiencing their work and the work in the Ruf•fle exhibition, they anticipate their audiences being ruffled enough to gain new ways of looking at the world, at themselves, and at the boundaries, or lack thereof, in artistic and design disciplines. Presenting work like this in an environment receptive to change and experimentation creates opportunities for discovery of the arts and design as socially and environmentally anchored. And, as Huston reminds us, we must never forget the crucial human component and its importance to art and design, and life, influencing our reactions and how we interact and react to work. While we might abstract to attain meaning and relevance from this exhibit, the utmost value of challenging norms and experiencing situations that compel thought and contemplation, is to remember the Socratic philosophical mantra and remind ourselves, “the unexamined life is not worth living.” It is with exhibitions like Ruf*fle that we are provided the moments, spaces, objects and time to question, to pursue answers, to think to the best of our ability, to examine our lives.